Micro projection was hot news at this year's CES show, with demos of various future systems. Now scientists at the Fraunhofer Institute for Applied Optics in Germany have created a tiny OLED projector that doesn't need any extra illumination, and takes very little power from the phone's battery. They predict that they will soon have a projector capable of projecting live TV from a mobile phone on to white walls or even seaside towels. The prototype OLED (organic light emitting diode) projector is 2.5 centimeters long, has a diameter of 1.8 centimeters and can be "easily integrated" into a mobile or PDA. 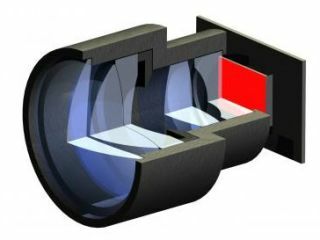 A lens system projects the image produced by the OLED onto a wall or other flat surface. The lenses are currently made of glass but the research scientists are already developing a system using cheaper plastic lenses. The OLED display produces a monochrome image with a brightness of 10,000 candelas per square meter; for colour images the brightness is about half that level. In comparison, a computer monitor generates about 150-300 candelas per square meter.